Moto Rapido Ducati’s Tommy Bridewell admitted after the final round of the Bennetts British Superbike Championship at Brands Hatch that a deal for 2019 hadn’t been confirmed. It was rumoured throughout the final three days of racing that the Wiltshire man had agreed a deal to race for Steve Moore’s Ducati team next season, on board the all new V4, but Bridewell expressed that no deal had been agreed between the pair. Bridewell walked away from Brands Hatch as the Riders Cup Champion, and after one of the strongest finishes to a season seen in BSB history, the 30-year old’s stock value has taken a meteoric rise. “Nothing has been announced about next year, and nothing has been officially confirmed,” Bridewell told BikeSocial with the Riders Cup trophy in his hands. 2019 will see a change for the Italian manufacturer, who will swap from a twin to a V4 engine in both British Superbikes and World Superbikes, a motorcycle that is highly anticipated by all. Built for racing on track the V4 has been developed with MotoGP technology from the Bolonga factory, with the red machines aiming for success in all three major championships throughout next season. And Bridewell is just as excited as every bike fan to see the potential of the V4, and admitted that it will be a ‘phenomenal’ package if he gets the chance to parade it during 2019. “There is a lot of hype about the V4, Ducati do not build a bad motorbike, so it will be a phenomenal package, yet the bike we have ridden this year has been a great bike. “It’s going to be an interesting one, it will be an interesting winter if I get a deal done with the team to ride the V4 next year, then we have a lot of work on. The Devizes man was quickly wrote off by many in the British Superbike paddock after a poor start to the season, which saw Martin Halsall’s former Movuno Suzuki team sack ‘Rock on Tommy’ mid-way through the Snetterton round. But, after a fourth-place finish at the gruelling Suzuka eight-hour race in Japan, he agreed to join the Moto Rapido Ducati team for the remainder of the season, and instantly he fell in love with the Panagale. He collected four podiums before the end of the year, but did he ever imagine he’d be in the position he is now following his sacking by Colin Wright? Bridewell said: “No, no, no! It’s credit to the team, I know I keep going on about it but since I’ve joined the Moto Rapido Ducati team we’ve taken massive leaps and bounds forwards. “Like I say finishing seventh in the Championship, it sounds silly, you’ve not won it, or finished second or third but from where I’ve come from, and from where the team were, to finish seventh in the Championship it’s almost like we’ve won it, the team morale is fantastic. “So, to finish the year with a double podium after a crash in race one and finishing the Championship where we have is credit to the team. The former Superbike Cup Champion spent two years in the wilderness in 2016 and 17, where he struggled to find his form that saw him in the Showdown with the Tyco BMW squad just three years ago. A year of challenge once again with Martin Halsall’s Suzuki backed squad, and a year of misery with Team WD40, where Bridewell failed to take to the podium with Brent Gladwin’s Sheffield based outfit. 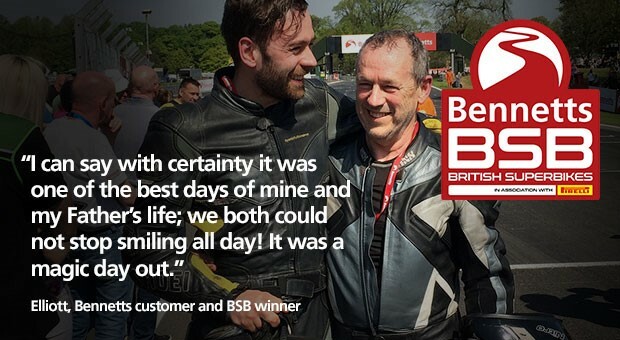 But the taste of success with the Moto Rapido Ducati team has once again put Bridewell well and truly in the shop window of every team in the Bennetts British Superbike paddock, an emotion he struggled to put in to words. “You can’t imagine it, I don’t know how to put it in to words, I’m speechless really. I’ve had the real s**t end of the stick I feel over the past couple of years. “So now to bounce back with a team that are behind me, and putting in as much effort, if not as more than me is great, hence the results. “And that is the only way I can word it really, the results do the talking so I have to keep my feet on the ground, I really did want to win the last race at Brands Hatch but it was too risky. It’s looking ever more likely that Bridewell and Moore will team up once again for a full attack on the Bennetts British Superbike Championship in 2019, after confirmation from the Team Owner on his personal twitter account that a rider had been signed. And rumours are circulating around the paddock that he could be joined in the team by what Bridewell described as a ‘fast team-mate’, and if rumours are true, Shane ‘Shakey’ Byrne could join the Moto Rapido Ducati outfit. With the recent success of the Wiltshire squad, they could be a force to be reckoned with as the action gets back underway in April 2019. Tommy Bridewell and MotoRapido Ducati become the 2018 Bennetts BSB Riders Cup champions!